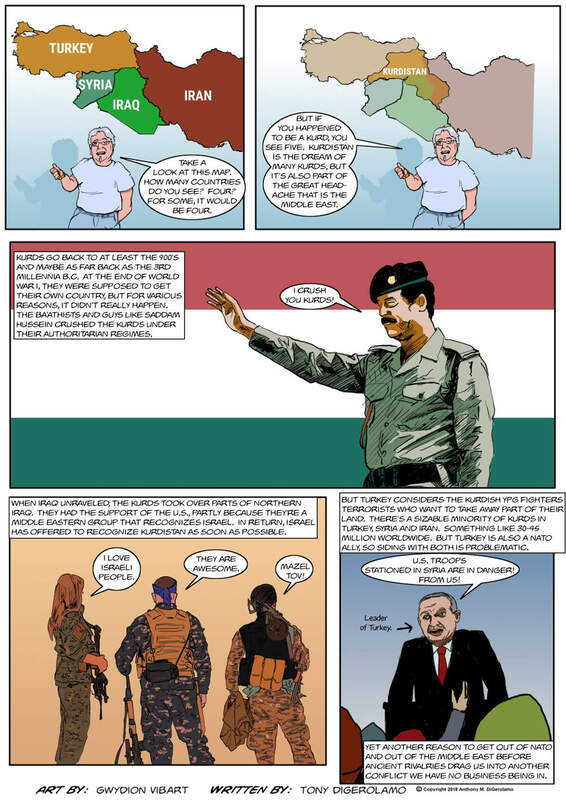 The Antiwar Comic: Where is Kurdistan? I am not understanding how you say the West has no business in the affairs of the Middle East. The current borders of Middle Eastern countries were created by the British Empire and U.S. was one of the 5 powers who created Israel (without Palestinians input I might add). Much (if not all) of the chaos happening the Middle East today can be laid at the feet of the U.S. and the West. And you see the resulting chaos. Intervention does not and cannot work. Israel has nuclear weapons, so it’s in no danger of being overrun, but it also has no reason to negotiate with its neighbors so long as Western powers continue to meddle on the country’s behalf. Pulling out of the Middle East would, at first, look worse because the various factions vying for power would take the time to try and grab it. But eventually, things would settle and the U.S. could return to a more neutral posture (if it ever had one). Unfortunately, it doesn’t seem likely until the U.S. breaks it’s economy so badly that it has no choice but to close the military bases overseas. You sound like you’re still stuck in the Cold War. Do you really think Russia, with a GDP equal to Spain, is a threat? The U.S. has always ruled the economic sphere, once we break the dollar, we lose. No amount of military hardware is going to save us when we can’t pay for it.